The Norton Anthology of American Literature - Description | W. W. Norton & Company Ltd. 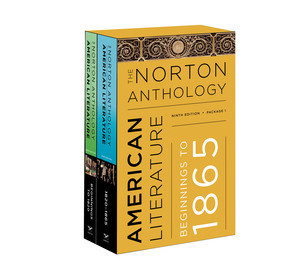 The most-trusted anthology for complete works, balanced selections and helpful editorial apparatus, The Norton Anthology of American Literature features a cover-to-cover revision. The ninth edition introduces new General Editor Robert Levine and three new-generation editors who have reenergised the volume across the centuries. Fresh scholarship, new authors—with an emphasis on contemporary writers—new topical clusters and a new ebook make the Norton Anthology an even better teaching tool and an unmatched value for students. Magnificent and strange, Pierre is a richly allusive novel mirroring both antebellum America and Herman Melville’s own life.